The golden-winged warbler (Vermivora chrysoptera) belongs to the family of New World warblers, the Parulidae. The golden-winged warbler is distributed in USA, Canada, Mexico, Guatemala, Honduras, Nicaragua, Costa Rica, Panamá, Colombia, Venezuela, Ecuador and Caribbean islands. These species hybridize with blue-winged warblers. These warblers are monotypic species. The golden-winged warbler (Vermivora chrysoptera) is a small New World warbler, measuring 11 to 12 cm in length and weighing 7 to 12 grams. The male golden-winged warbler has bright golden-yellow patch on the forecrown. There is also a golden patch on the wing. There is a black throat patch and an black ear patch. There is a white supercilium. The upperparts are bluish gray and the underparts are whitish gray. In females, the black patches are replaced by grayish patches. The steel-gray bill is slender and sharp pointed. The legs are gray. The irises are blackish. There is a gray eye-ring. Their call is a trilling buzzy note or a buzzy "chip.. chip" sound. 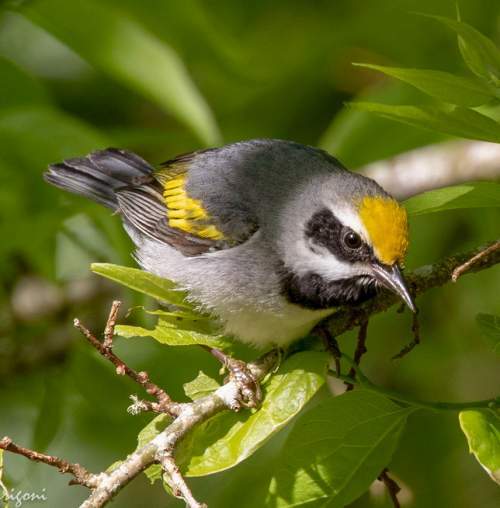 The golden-winged warbler is distributed in northern USA, southern Canada, Mexico, Guatemala, Honduras, Nicaragua, Costa Rica, Panama, Colombia, Venezuela, Ecuador and several Caribbean islands. Vagrant birds have been recorded in United Kingdom, Trinidad and Tobago, Sint Maarten (Netherlands), Barbados, Curaçao (Netherlands) and French Polynesia. 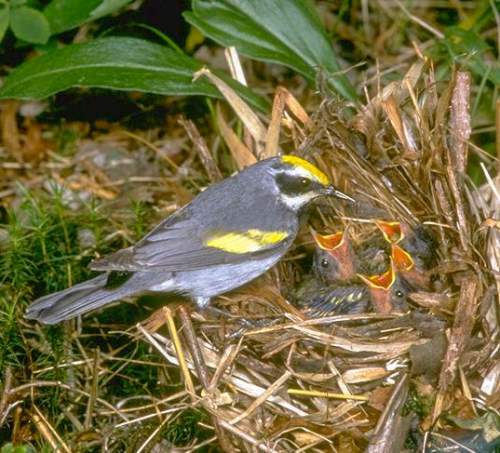 The golden-winged warbler species have moderate forest dependence. They normally occurs in altitudes between 0 to 2000 meters. The artificial ecosystems and habitats of these species include pasturelands. The natural ecosystems and habitats of these warbler species include tropical and subtropical moist lowland forests, temperate forests, grasslands and shrublands, moist shrublands and wetlands. The diet of these golden-winged warbler species consists mainly of insects. Larval insects, insects, moths, caterpillars, grasshoppers and spiders are their primary food. They mostly forage for insects in the middle and lower canopy. They occasionally descent to the floor to feed on insects and small invertebrates. The breeding season of the golden-winged warbler species is from May to July in most of their breeding range. These birds are monogamous and nest solitarily. The breeding habitat is on the ground, hidden in bushes. The nest is a bulky cup made with grass, rootlets and plant fiber. It is lined with hair, fine grass, shreds of bark and fine rootlets. 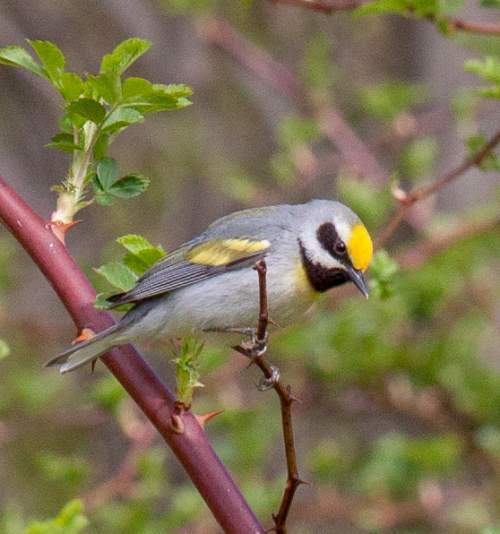 These species hybridize with blue-winged warbler to form two distinctive hybrids, the genetically dominant Brewster's warbler and the genetically recessive Lawrence's warbler. These warbler species are fully migratory birds. The breeding populations occur in northern USA and southern Canada. They migrate to the wintering grounds in August and September. The wintering populations of these species are distributed in Central America from southern Mexico to Panama, Caribbean islands and northern parts of South America. The return migration occurs in early summer. The global population size of the golden-winged warbler (Vermivora chrysoptera) has not been quantified. The overall population trend of the species is considered to be decreasing. In most of its range, this species is reported to be uncommon. The generation length is 3.8 years. Its distribution size is about 2,080,000 sq.km. Ecosystem degradation, ecosystem conversion, severe weather, climate change and agricultural expansion are the main threats that may endanger the survival of the warbler species. The golden-winged warbler (Vermivora chrysoptera) species is approaching the thresholds for being Vulnerable under the range size criterion, under the population trend criterion and under the population size criterion. The IUCN (International Union for Conservation of Nature) has categorized and evaluated the species and has listed it as "Near Threatened". The CITES (Convention on International Trade in Endangered Species of Wild Fauna and Flora) status is ‘Not Evaluated’ for the golden-winged warbler (Vermivora chrysoptera). The golden-winged warbler (Vermivora chrysoptera) is closely related to the blue-winged warbler (Vermivora cyanoptera). Website for detailed description and information on distribution, habitat, behavior, feeding and breeding habits, migration and conservation status of beautiful birds with their images.